This Baked Buffalo Chicken Hummus Dip is the perfect appetizer for any gathering! It’s easy to prepare, made with 6 simple ingredients and loaded with flavor. 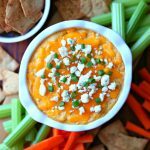 Turn your favorite buffalo chicken dip into a healthier version with this delicious Buffalo Chicken Hummus Dip! In large bowl, mix hummus, ranch seasoning, and buffalo sauce. Add in chicken and 1 cup cheddar cheese. Continue to mix until well combined. Top with green onions and blue cheese crumbles. Serve warm with carrots, celery, and pita chips.